The Byway of Art is a socially-engaged art project about community process and participation. In Lyons, Decatur, and Oakland, unique artworks emerged from the stories of each place. 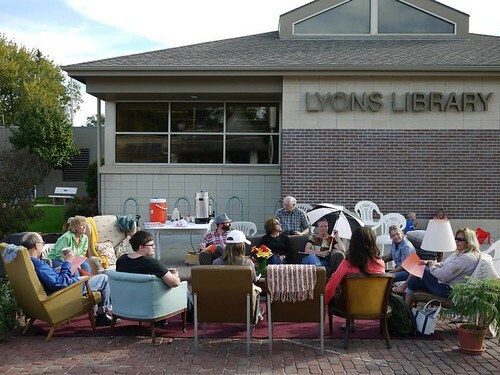 “What makes your town special?” asked the Center for Rural Affairs and visiting artist Matthew Mazzotta at their “outdoor living room” events, where residents got comfortable in couches and chairs assembled along their town’s main street. Using these conversations as a guide, Mazzotta and the Center translated each town’s unique character into three site-specific designs. The Byway of Art is made possible with funding from ArtPlace America. In Decatur, residents referenced a trolley car that once operated in the town of 500 people. The legend, as it turned out to be, was traced back to several early postcards. The postcards -- showing a trolley superimposed on main street -- were used to market the town to outsiders. “Rural Legends” -- the town’s new storytelling venue in an old trolley car -- was born from this quirky legend; the result an artwork that turns fiction into reality. Byway of Art: Decatur's Rural Legends from Center for Rural Affairs on Vimeo. The “Storefront Theater” in Lyons came from the town’s concern over vacant storefronts and fond memories of the old movie theater. The Center’s hometown, organizers engaged with the community and the artist to create an outdoor theater that literally folds out onto main street -- turning an abandoned building into a functional artistic space for the community to enjoy. At the Theater’s first event, over 200 people attended the premiere of a local filmmaker’s documentary about Lyons’ Main Street. In 2016, the project won a national award for compelling public art. Byway of Art: Lyons' Storefront Theater from Center for Rural Affairs on Vimeo. The project in Oakland is equally exciting and engaged. Lycka Til, a usable art piece, was inspired by the towns’ Swedish culture and was completed in May 2017. Oakland residents agreed that it captured their Swedish heritage. A mobile stage with a backdrop of Swedish row homes, it was dedicated before a performance of “Ole’s Last Bow,” a musical based on a true story of Ole Ivverson, one of the last Swedish vaudeville performers.